Could you tell us something about yourselves and your cooperation? We are both ceramicists. We both share a delight in materials, an enthusiasm for good design and for the creative process which drives us. Based on the conviction that we should pool our know-how and the mutual pleasure in porcelain and stoneware, we decided to develop a joint collection and founded kaas + heger in 2016 as a start-up. And now, the first jointly designed product line has been brought about. 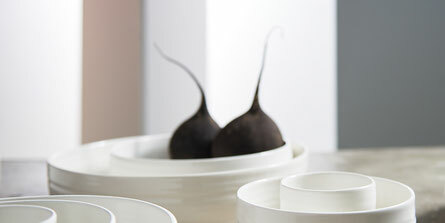 What do porcelain and good ceramic design mean to you? Clear design idiom, good usability, highest quality, sensuous materiality, convincing aesthetics. No-frills products whose functionality is as variable as possible. To achieve a lot with little, no abundance, no waste of energy. How are your ceramics created? The development process is dialogical and experimental. Our designs are not computer-made. The ideas are directly formed and developed with the material. The production is pure craftsmanship. Each vessel is thrown on the wheel and therefore unique.